A will is a declaration of how you want your assets distributed following your death. A statutory will is a simple type of will legally recognized by only a handful of states. A living will provides directions for carrying out your wishes regarding your health care if you become incapacitated and cannot make decisions for yourself. A regular will and a living will can work together as part of an overall estate plan. Although wills are often complex documents, there are very few elements that are essential to a will. A will must generally be in writing; only a handful of states accept oral wills, and only under strict requirements. However, several states accept a handwritten, or holographic will as valid under certain circumstances. 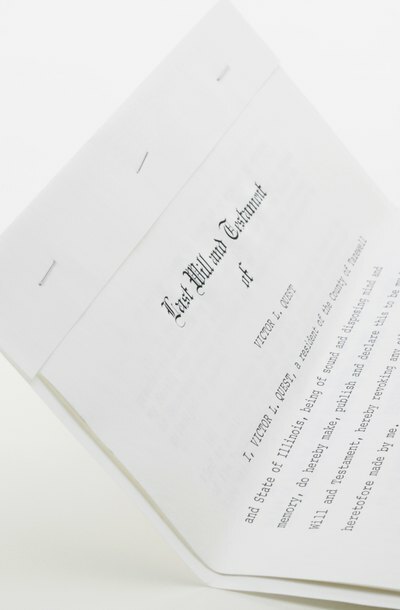 In general, a will must contain a statement that the person drafting the will is of sound mental capacity and that the document represents her wishes concerning the distribution of her estate after her death. The will must be executed in the presence of competent adult witnesses; many states require two witnesses, although some states require three. The person drafting the will must also sign the will. A statutory will is a simple, standardized document that often includes fill-in blanks and check-mark boxes for information such as the name of the person drafting the will, the names of beneficiaries, the name of the executor or personal representative, and the amounts of any bequests, or gifts made to beneficiaries. There are also spaces toward the bottom of the document for the names, addresses and signatures of witnesses, as well as for the signature of the person drafting the will. Some statutory wills include sections for gifts to charities. While statutory wills are fine for small estates and emergencies, they don't work well for blended families or complex estates. In addition, as of 2011, only California, Maine, Michigan, New Mexico and Wisconsin recognized statutory wills as valid. A living will does not involve instructions for the transfer of property. However, living wills do provide instructions for medical care in the event that the person drafting the document becomes incapacitated. Provisions commonly included in living wills include whether to administer or withhold artificial respiration or resuscitation in cases where there is little or no chance of recovery. To be valid, the person drafting a living will must be an adult over age 18 and of sound mind. States vary in additional specific requirements. As early as 1995, 47 states recognized the legality of living wills. However, a living will is only effective if the healthcare provider has a copy, and if the document is registered. It's also wise for the person drafting the living will to carry a pocket card stating that a living will is on file. Many people draft a durable power of attorney for health care along with drafting a living will. This is because a living will does not include provisions for a health care proxy, or person designated to make health care decisions for the incapacitated individual. Like living wills, durable power of attorney documents enjoy broad acceptance across the United States. A will, also known as a last will, distributes a person's property after his death. A living will, on the other hand, explains what kind of medical care that person wants when he is still alive but unable to explain his wishes. In most states, both a will and a living will have similar requirements as to format, but the two documents serve very different functions.